Every year, IDC surveys over 500 technology administrators, managers, directors, and CIOs/CTOs to determine their most pressing issues in storage. For the past three years, the top priorities have been time and budget to implement advanced storage functionality, and developing a roadmap from existing storage to the next generation of storage technologies. Notably absent is the procurement and management of raw storage capacity, and with good reason: we removed it from the survey. When it was part of the questionnaire, it was the top priority by such a large margin that all other issues essentially disappeared. Enterprise data will continue to grow at double the rate of datacentre cores, double the rate of connected devices, and at EIGHT times the rate of mobile users over the next year with over 24 zettabytes (billion terabytes) of data being created in 2018, compared with 2 zettabytes just five years ago. How will Canadian organizations hope to cope with this growth, when they've indicated that storage budgets and administrator headcounts will grow by less than 10% during this period? Traditional storage procurement models involve estimating storage capacity requirements across the organization, purchasing arrays and capacity in large "chunks" after a drawn-out procurement process, leading to a period of overprovisioning. 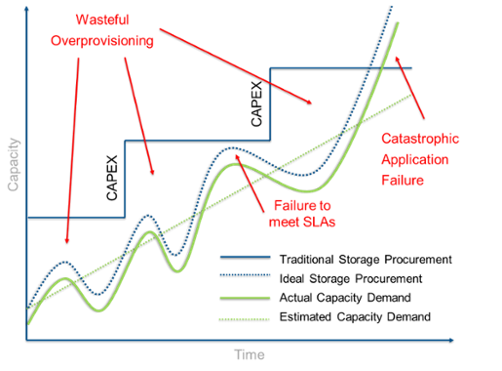 Staying ahead of capacity demand requires the organization to make large capital expenditures, while failing to do so creates the probability of failing to meet performance SLAs or the possibility of a catastrophic application failure, costing the organization resource cycles, revenue, or, worst of all, customers. So, How do I Achieve That Dotted Blue Line? The Cloud? In a perfect world, organizations' storage capacity would have effectively unlimited supply and metered usage, with costs only accruing if and when capacity is utilized. With constantly falling storage prices and constantly increasing technological capabilities, spending too much for today's storage in hopes that it will meet your needs in the future is wasteful. However, running out of storage capacity or IOPS for a critical workload is unthinkable. The actual cost per unit of storage capacity is higher than in the traditional model. There is time, cost, and risk associated with migrating workloads to, within, and from the cloud. The higher and sometimes unpredictable latency of cloud storage makes it inadequate for certain workloads, especially in a failover or DR situation for the cloud provider, where a sudden 100ms jump could render an application nearly useless. Cloud storage, both public and private, is an integral component of a successful storage deployment methodology, and has tremendous value for some data, in some applications, for some organizations. But for IOPS-intensive workloads such as databases or broadly virtualized applications, or latency-dependent operations such as OLTP, financial market transactions, or even VoIP or video, cloud-induced latency can be a non-starter. If Traditional IT Can be Wasteful, and Cloud Can be Inappropriate … Isn't There Something in the Middle? Our storage mantra is "the right workload, in the right place, at the right time." This means that live data needs to stay close to compute resources, whether that's in your datacentre or in the cloud. Less valuable data needs to be on less expensive storage media in an easily managed environment. Shared data can't be siloed by an internal network. IDC feels that hybrid deployments will remain the dominant modality for enterprise IT during our forecast period, and a key part of that philosophy is on-demand storage. In an on-demand, or utility model, storage resources are deployed where customer demand exists, on-premise or "close to the cloud" in a colocation centre, in amounts larger than estimated requirements, with room to grow in the future. The upfront cost and associated risk is borne by the vendor, and passed on to the customer only when utilization takes place. Customers with highly variable workload requirements can gain some of the benefits of storage as a service, such as the shift from large capital expenditures (capex) to ongoing operational expenses (opex) based on usage, and the reduction of uncertainty of utilization spikes or capacity growth. At the same time, capacity is presented to applications with characteristics more similar to traditional IT, with the ability to choose IO profiles, reduce latency, and manage data closer to compute resources with more granularity and flexibility than a cloud deployment. IDC recommends that customers look for storage vendors with the ability to provide not just the technological prowess to meet their storage needs, but that are also able to provide a road map that meets future expectations and the financial tools capable of optimizing storage deployment and data management. Explore some of the reasons for moving to a consumption model, and discover three types of storage offerings that can be purchased using this type of model by downloading the “Will Your Data Benefit from a Cloud Consumption Model?”eBook. As Research Manager within IDC Canada's Infrastructure Solutions Research Group, Dave Pearson covers the Canadian Disk and Tape Storage Markets as well as Networking Equipment. 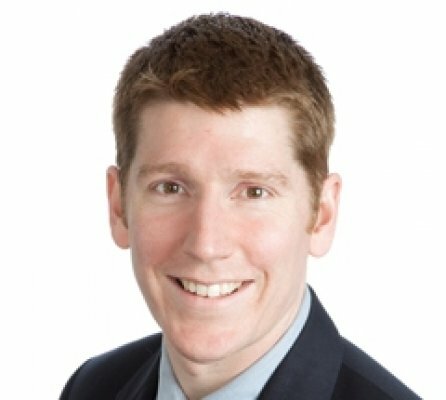 Dave Pearson joins IDC Canada with over a decade of international experience in IT, from sourcing and selection to project management. Dave began his career with Veritas (Japan) and enjoyed stints in Austria and the US with incubator Blue C GmbH. Most recently he has been providing consulting services to SMBs and healthcare institutions across southwestern Ontario in the areas of infrastructure development, business continuity and data management.